Reubens has appeared on stage during the past few years at special event performances at West Hollywood's intimate Groundlings Theatre on Melrose, a performance/lab space for improv and sketch comedy, where Reubens first performed The Pee Wee Herman Show in 1981 -- created partly from the anger of being rejected for that season's Saturday Night Live. 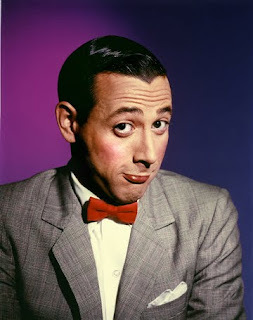 Reubens' act transferred for a five-month run at the Roxy nightclub, was broadcast on HBO, and Pee Wee Herman was suddenly a national representative of our infantile inner selves, perpetually at war with a mercilessly macho world. Annette Bening will appear as Euripides' Medea at Royce Hall, UCLA as part of UCLA Live's fall season: Previews start September 18, the productions opens to the press September 23 and plays through October 18. The production, with a 12-woman chorus and onstage musicians, is to be created by Croatian theater and opera director Lenka Udovicki. Bening and Udovicki approached UCLA Live's curator David Sefton with a proposal for this original production, and he said yes. UCLA Live is the West Coast equivalent of BAM, and Medea marks the first time in UCLA Live's brief but illustrious ten-year history that Sefton will serve as producer instead of presenter. On the heels of my last post about Center Theatre Group placing its bets on theater companies rather than playwrights for the development of new work, Culture Clash's playwright Richard Montoya wrote me with a very good further distinction, that CTG's commissions of Culture Clash speculate not so much on his troupe, but on the audiences the troupe might attract. It's an interesting point that ties commissions more closely to marketing than I'd thought of. Today, CTG announced that it has received a $1 million, three-year grant from the Andrew W. Mellon Foundation for the development of new works that are non-text based. This is good news for those in the multi-media vis biz, but not particularly encouraging for playwrights. That's probably a good thing. Playwrights have been getting far too much encouragement lately.